now reading: How Does Catnip Affect Humans? How Does Catnip Affect Humans? Nickels was a hulking, gray, long-haired tabby, a gentle giant. She enjoyed eating, sleeping, cuddling, and general lollygagging. By any definition, she was your typical friendly cat. That all changed one afternoon when she got a hold of the "Nip." At first, she rolled around in apparent bliss, purring like a V-6 engine. It seemed like she had simply become a more lubby-dubby version of her lovable self. I moved to innocently pick her up, but suddenly she lashed out furiously with her bear-like paws, claws extended. They caught the supple flesh of my forearm and scratched deep. I recoiled in pain and surprise, shocked at what my feline friend had just done. She stared straight at me, growled, and then hissed. Nickels had transformed into a drug-crazed wildcat. The effects of catnip (Nepeta cataria) on cats are well-documented, both scientifically and anecdotally. In response to nepetalactone, one of catnip's volatile oils, the majority of felines will sniff, lick, and chew the plant, then proceed to roll around and rub their heads and bodies on nearby surfaces. If catnip is ingested, some cats may foam at the mouth and grow drowsy or even extremely aggressive. They may also unleash guttural moans, an act interpreted as a response to hallucinations. But what about catnip's effects on humans? Specifically, does it engender similar behavior-altering outcomes? In the 1600's, catnip was commonly prepared in tea to remedy nervous headaches, hysteria, and insanity. But somewhat contradictorily, one historical reference stated that chewing the root will make even the "most quiet person fierce and quarrelsome." In the 1960's, catnip was briefly popular as a replacement drug for marijuana. A couple of reports indicated that it can produce auditory and visual hallucinations, as well as produce feelings of euphoria and intoxication, very similar to marijuana. In 2001, one motivated experimenter smoked five bowls of catnip, intermixed with huffing cigarettes, and reported that it had "similar effects to pot, minus the high." He also documented that tobacco "easily doubled" catnip's effects, a statement which is actually corroborated by far more legitimate research. 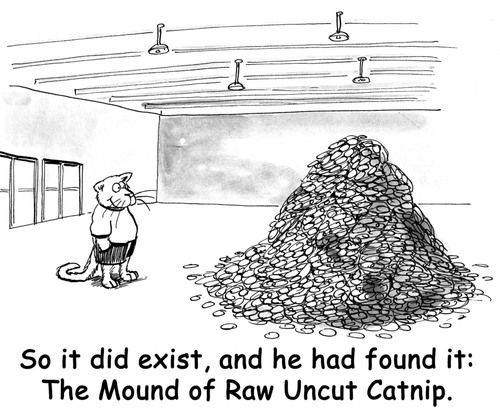 On how catnip precisely alters human consciousness, uncertainty still prevails. Personal accounts abound, but large, substantive studies have not been conducted. Engaging in such research would likely be impractical, but it would certainly sate some curiosities and might even be a future frontrunner for an Ig Nobel. Are there any willing researchers out there?